Gov. Kevin Stitt has appointed Steve Buck to be his cabinet secretary of human services and early childhood initiatives. He has also appointed Charlie Prater to be a member of the Oklahoma Tax Commission. Buck is executive director of the Oklahoma Office of Juvenile Affairs and had served as Gov. Mary Fallin’s health and human services secretary since November 2017. He would become the first Fallin cabinet member to be retained in Stitt’s cabinet. Buck’s name has been in the news recently after a teenage girl died following a suicide attempt at an OJA facility in Tecumseh. Multiple employees of the facility told News 9 that they believe the death could have been prevented. Prater is a certified public accountant who ran for state auditor and inspector in 2018, losing in the August Republican runoff by fewer than 1,000 votes to Cindy Byrd. Byrd won the November general election and was sworn into office in January. Byrd and Prater clashed heavily during a primary debate hosted by NonDoc. “Charles Prater has built a successful career in accounting and finance, and his knowledge and expertise will serve Oklahoma well as we work toward greater transparency and accountability in state government,” Stitt said in a statement sent to media after the initial publication of this post. The media release included statements from Prater. 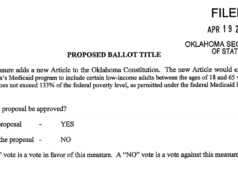 If confirmed by the Oklahoma State Senate, Prater will join former State Auditor and Inspector Steve Burrage and former Sen. Clark Jolley on the three-member Tax Commission. Prater would replace Thomas Kemp. Buck’s appointment will also require Senate confirmation. His appointment was filed Wednesday with the Oklahoma Secretary of State, which posted the filling on its website. Prater’s appointment was filed and posted today. Stitt announced a restructuring of his cabinet in January, creating additional cabinet positions and separating health and human services in doing so. He has appointed 11 people to his cabinet so far. Stitt has now made 32 appointments since taking office Jan. 14. A full list can be found here.